This entry was posted on October 22, 2015 at 12:44 pm and is filed under Uncategorized. You can follow any responses to this entry through the RSS 2.0 feed. You can leave a response, or trackback from your own site. It was mentioned in the movie. I think in the scene with Alan Alda if I’m not mistaken. As far as historical Spielberg pieces go, I liked this even more than Lincoln and Munich. There may be others but those immediately come to mind. I seem to be the only one that thought this was just ok. To me it seemed very conventional and a little dull. There were a lot of plot points picked up and then never mentioned again. But it was well made and acted by Hanks but I nodded off twice so that’s not a good sign. I guess I will have to see it again because everyone else seems to see something I didn’t. It was about the dialogue. I just loved the script. That’s cool. I didn’t dislike the script but didn’t think it was anything special. Will have to watch it again and see what I missed. Nice review. It’s a solid film by two masters; I wouldn’t call it epic or outstanding, but certainly worth the price of admission. Epic implies something grand and this was just the opposite. It was exquisiste for those simple spoken interactions between characters. Those scenes with Tom Hanks and Mark Rylance are just wonderful. I’m seeing this on Halloween, and I’m very excited! Good review, glad to see Steven Spielberg has another great movie out. It seems like this and Steve Jobs are (currently) the frontrunners for Best Picture, and I’d really love to see Spielberg win again. Steve Jobs, and to a lesser extent Bridge of Spies, have tanked so badly at the box office. Not sure if they still have the momentum for a Best Picture win anymore. Attention has turned to the upcomming Spotlight and Joy for now. I enjoyed it, technically it was near enough perfect, especially the period sets & costumes etc. I also liked that it was quite funny in parts. But as smilingldsgirl says it was only okay, I wasn’t riveted or bored. I liked it but can’t imagine I would see it again. 3 Stars from me. That’s fair. I did enjoy the script quite a bit. The dialogue was on point. I loved this. It was well written and very well acted. Serious story also had a little comedy here and there. I liked that. Hope it garners some Oscar noms for Tom Hanks and Mark Rylance. 4 stars. Tom Hanks was fine, but Mark Rylance was truly memorable. I hope he is recognized. 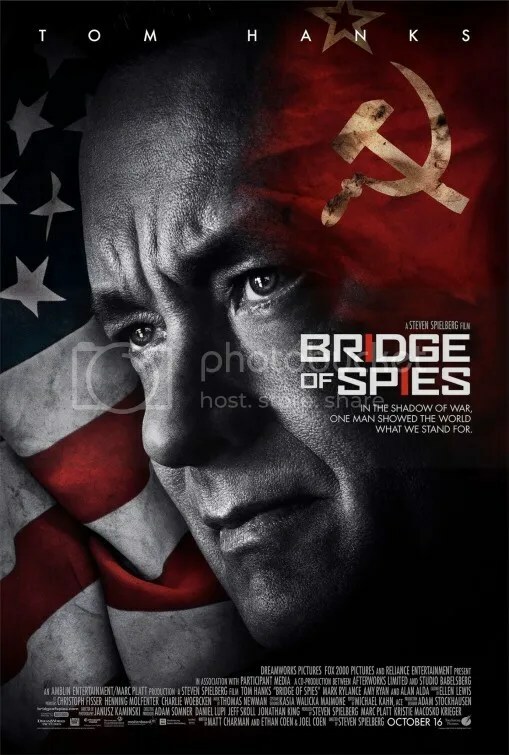 Tom Hanks exudes so much dignity and class in this film. His character’s commitment to doing the right thing is so admirable. Like you say, it seems too good to be true, but with Hanks in the role, you never doubt his convictions for a second because of his sincerity. I also couldn’t agree more with your statement,”The complications surrounding the tricky negotiations don’t rely on breathtaking action but they are fascinating nonetheless.” This is mostly a movie about people in rooms talking, which should be boring, although it never is with Spielberg at the helm. As you say, he adds just the right amount of reverence and flash. Tom Hanks is perfectly cast.